We understand how complicated it can be to break free from the primitive web design mold of the previous years and transition to something more user-friendly and responsive. 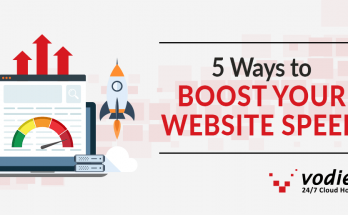 More brands are now focusing on creating a good-looking mobile website as stats have shown that 80% of online visitors prefer to search on their smartphones so it makes sense to go this route to optimize your website for better conversion. So before we end 2015 with a loud bang and welcome 2016 with open arms, we’d like to share our first ever annual list of our favorite mobile responsive websites. Allow yourselves to be inspired by these responsive web designs and apply your creative ingenuity to your own website. 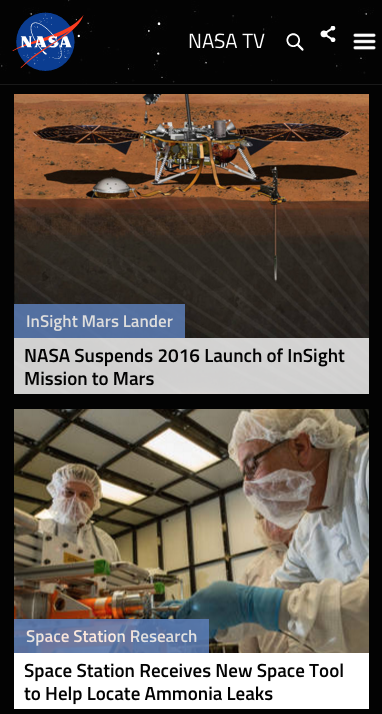 For the science geeks out there, you would surely love hanging out at NASA’s official website–both on mobile and desktop! 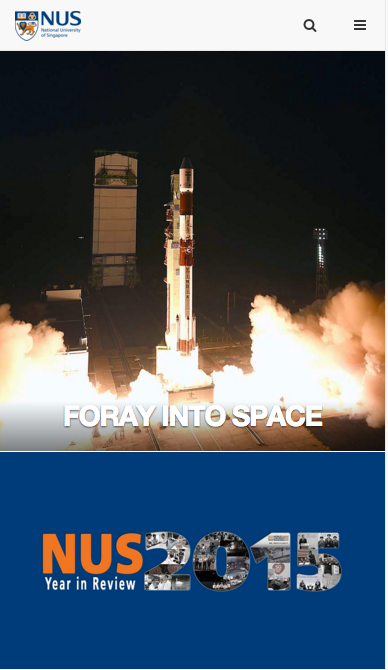 Just tap or click on its menu will get you right to different categories or interesting stories that make universe an interesting place to live in. One of Singapore’s popular e-commerce shops that lets their customers shop groceries online, Redmart further up the ante with their mobile-responsive website. 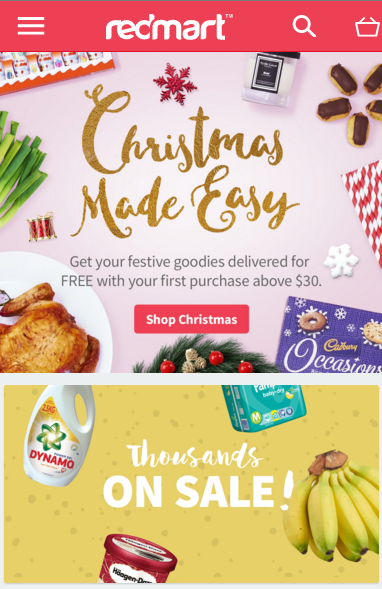 Scrolling through their product deals and searching for your favorite grocery items is such a breeze so it’s no wonder why many Singaporean shoppers are in love with this website. If you’re into web designing, you will surely enjoy going to Speckyboy. Since it is a web design blog after all, you would come to expect them to live up to its niche in providing an awesome mobile-responsive experience for their visitors. The good news is, they don’t disappoint because Speckyboy’s clean, minimalist design is just about right. 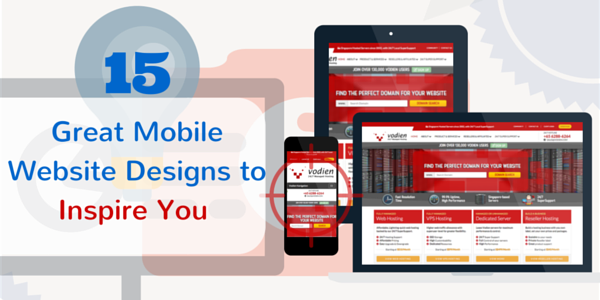 You can effortlessly navigate around their mobile site and immerse yourself with their hundreds of interesting articles and images to help you with your web designs. Want to know the top viral stories that are making the rounds on the Internet? 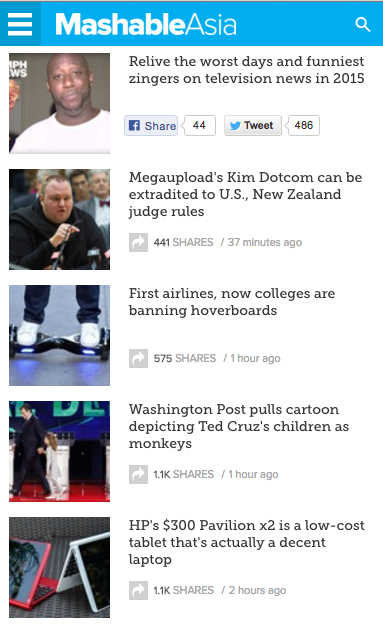 Go head down to Mashable’s site. It displays its content effortlessly with smooth user interface that makes it extremely easy to read on the go. You’ll find different ways to share their content on social media, too. Change.org’s mobile website seamlessly adjusts to the mobile device’s screen size and resolution so you can view their content in any way you want. 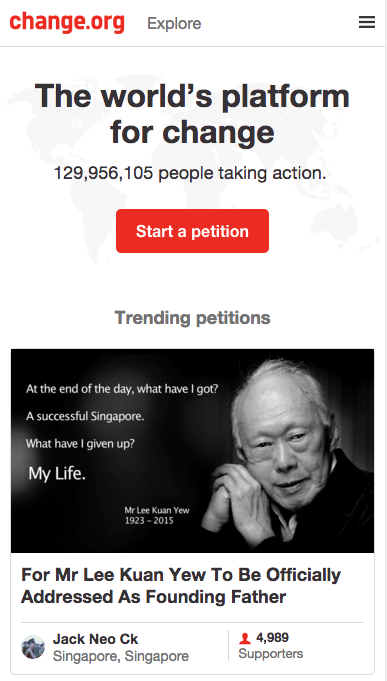 It features a smart call-to-action button right on top of the site so there’s no reason for you not to broadcast your petitions for social change. 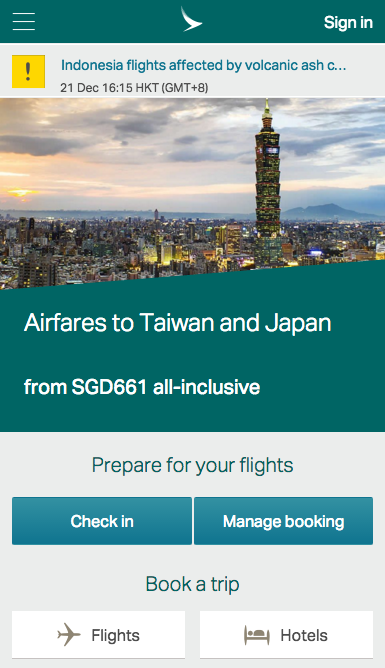 Cathay Pacific is an airline company with a lovely mobile website to boot. The experience of browsing through their mobile site was generally remarkable and intuitive. All the buttons are strategically placed to help the user manage their flight bookings quickly and efficiently. Thinking of buying your loved ones with unique holiday gifts or probably sell your handmade items? 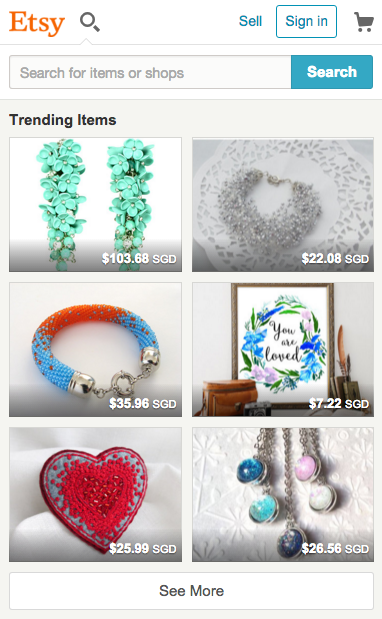 Etsy is the place to be. Their mobile site will instantly greet you with a search bar so it’s easy for you to discover products that you might not find elsewhere. 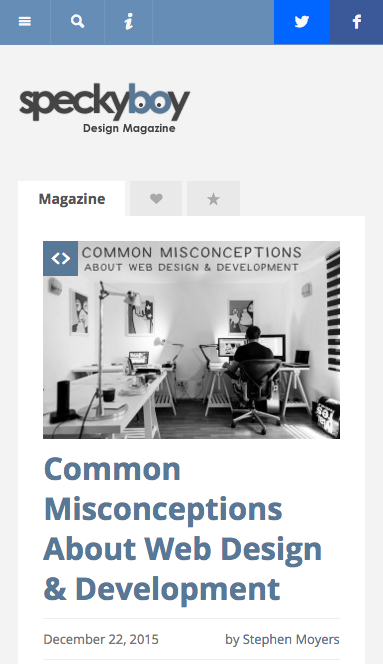 We love how their thumbnail images looks professionally taken and designed for the creative hipsters out there. 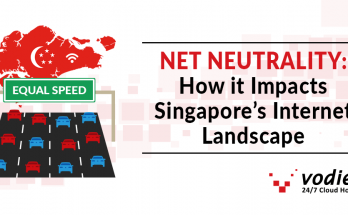 Besides their stellar reputation as one of Singapore’s well-renowned educational institution, NUS also boasts of a remarkable mobile website where you’ll find all their outstanding achievements posted. Swipe left and you’ll get quick links to their main menu and other pages that will help their students, faculty, alumni and interested visitors with what they’re searching for. 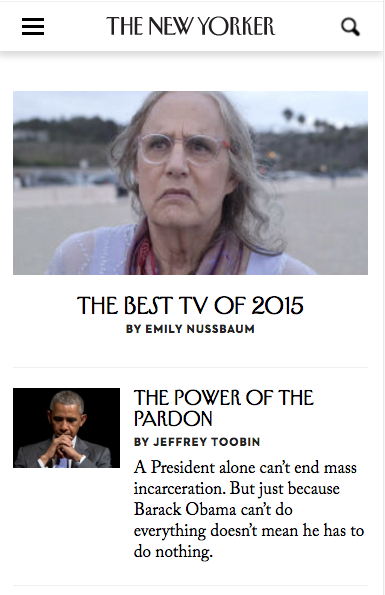 Are you a regular subscriber of ‘The New Yorker’? Then I’m sure you’ll love navigating around their mobile website, too. 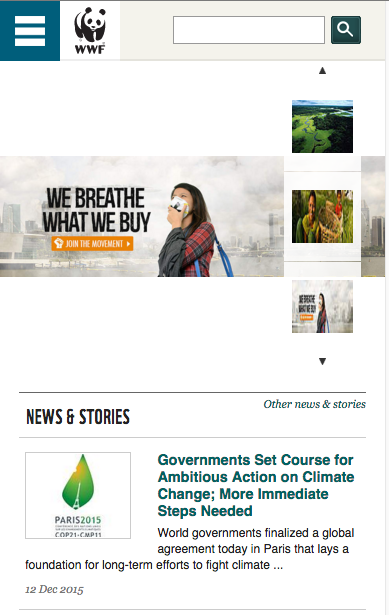 It features seamless and clean responsive design, with avant-garde fonts that their avid readers have come to love. Of course, there’s a nifty search button right beside logo so that searching for your favorite content will be easy breezy. 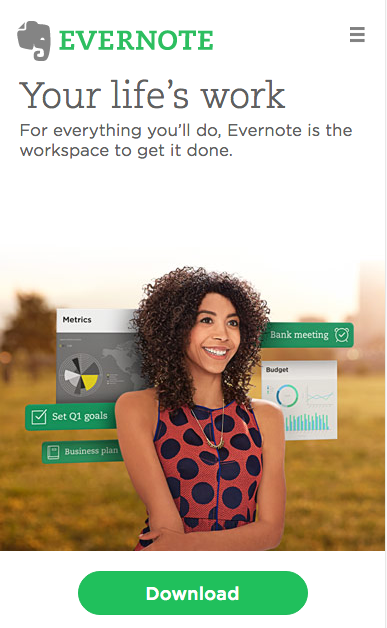 For the uninitiated, Evernote is your all-around note-taking app that lets you take notes, bookmark articles (using their Web Clipper plugin), annotate images and share your ideas and notes with your team. What Evernote did right was the fact that their app works conveniently on desktop, smartphone and tablets. So what’s not to love, right? On their homepage, you’ll be prompted right away to download their app for your smart device or you may opt to simply sign in right on their web browser. It’s noticeably clean so it forces you to focus on what really matters–taking note of your ideas, anywhere you are. 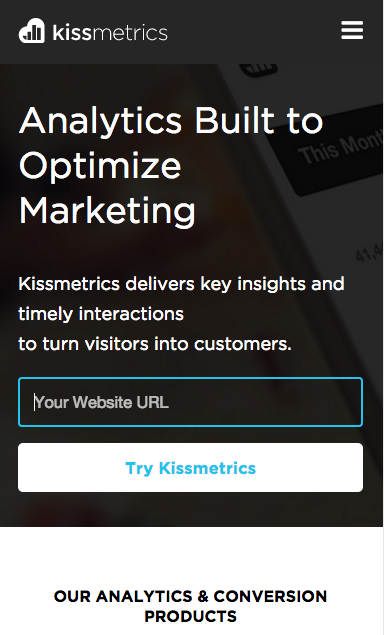 KISSmetrics provides customized insights on how well a website is performing with their help of their state-of-the-art analytics software. We like how everything on their mobile site is displayed with a clear focus on usability for their readers rather than bombard them with a copious amount of texts or information that they might skip, in the first place. 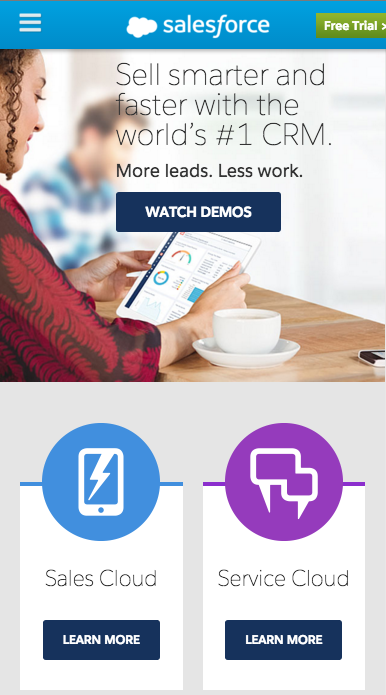 Designed specifically for businesses, Salesforce has been a game-changer when it comes to optimal CRM solution. 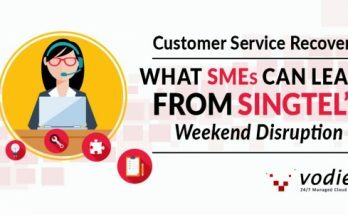 It serves all the essential business applications from their cloud servers so that companies can focus their energies on selling, generating leads, acquiring new customers and improving their marketing efforts. 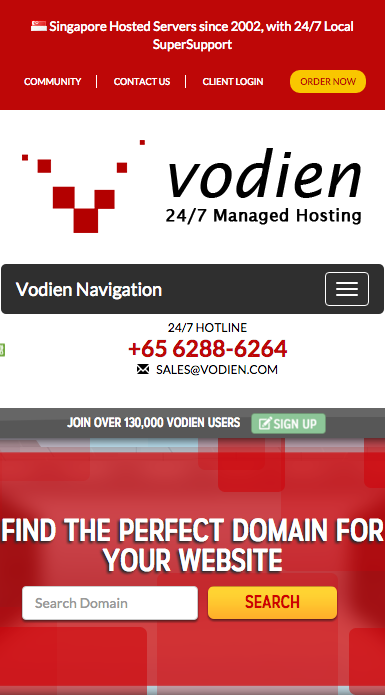 Their homepage trims down to the basic essentials and none of the unnecessary fluff. For those who is not familiar to WWF, it’s a non-profit organization that creates innovative solutions to protect and conserve nature. Make sure to check out their mobile site where you’ll find quick links to donate on their various causes or educate yourself on how you can be part of their movement and save Mother Earth’s natural resources. We are happy to announce that our website’s design was recently revamped so expect it to be more intuitive, clean and mobile-responsive, whether you’re on desktop or mobile. We made sure that our clients will easily get the answers that they’re looking for with our site, but should there be any questions, just tap the 24/7 LiveChat button and one of our SuperSupport staff will quickly assist you. Visiting our has never been so simple! These are some of our favorite mobile-friendly websites. Which of them do you like? Share them in the comments below. Next Article Enhance Your Mobile Web Pages with AMP!